Tutorial: Repairing and styling colour, featuring 'The Grading Sweet. The secret is at the end, but to get there, we need to start at the beginning. One of the great benefits of using Final Cut Pro version 4 is the ability to customize it's keyboard shortcuts to match your style. 5) Drag the command you want to use on top of the key to which you want to assign the shortcut (i.e. "F"). From now on, every time you press "Control-Option-F," Final Cut will fit whatever your working on into the window; very helpful for resizing the timeline. "Well, yes, of course," I hear you say, "but there's nothing NEW here. We've always been able to do that in FCP 4." True, we HAVE always been able to create new keyboard shortcuts in Final Cut. BUT, what about LiveType, or SoundTrack, or, well, any other application you are currently working with? Wouldn't it be nice to create new keyboard shortcuts in them, too? Or, how about remapping shortcuts that you don't like? Well, there's a new feature in OS 10.3.x that makes creating customized keyboard shortcuts simple. And here's how it works. However, for this to work, you first need to install OS 10.3 on your system. 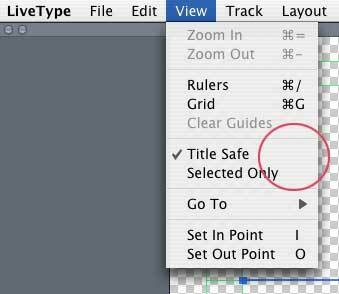 Now, in this example, let's open LiveType and find a menu that doesn't have a keyboard shortcut associated with it. 3) Scroll all the way down the list of shortcuts to the very bottom. 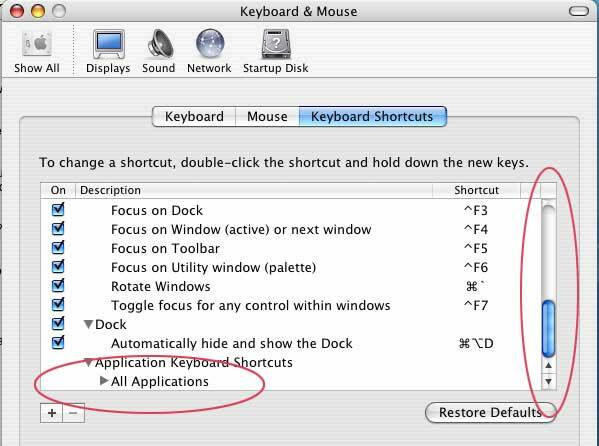 4) Twirl down "All Applications," then click the Plus ( + ) key. 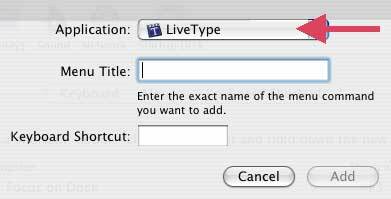 5) In the sheet that slides down from the top of the window, select "LiveType" from the pop-up Application menu. 6) Then, and this is important, in the Menu Title field, type the name of the menu EXACTLY as it appears in the application. 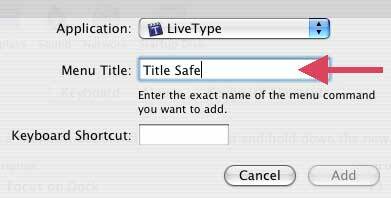 In our example, type "Title Safe" -- spelling, capitalization and punctuation must be exact. 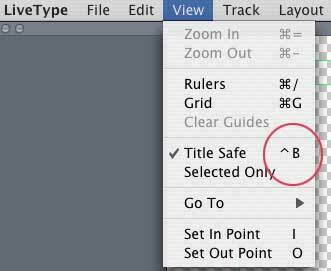 7) Then, in the Keyboard Shortcut field, type your shortcut. Again, in this case, hold down the Control button and press B. 8) Press the "Add" button and quit out of System Preferences. 9) Open LiveType and pull down the View Menu. Ta-DA! Your new keyboard shortcut is now installed as part of the application. 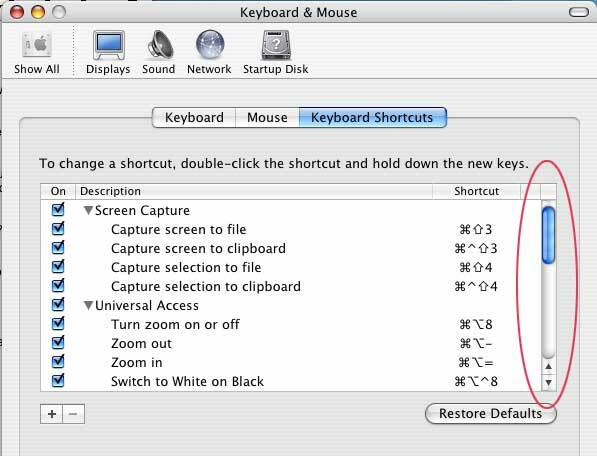 1) You can replace existing keyboard shortcuts with your own by following this same procedure. 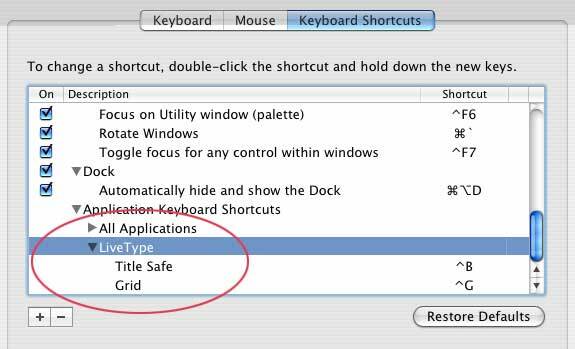 For instance, you change View -> Grid from "Command-G" to "Control-G" by entering "Grid" in the Menu Title field and "Control-G" in the Keyboard Shortcut field. 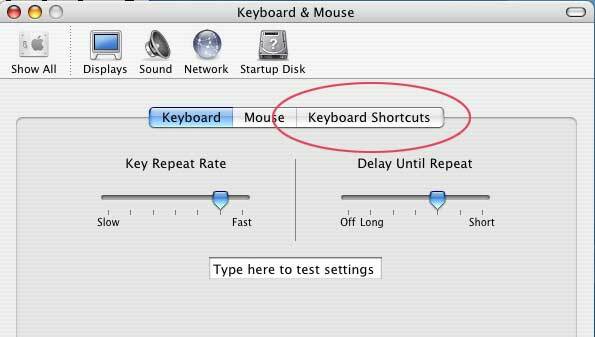 This gives you the power to change keyboard shortcuts in ANY OS X application. 2) To remove the changes you made, go back to the Keyboard Shortcuts and scroll down to the bottom of the list. 1) Twirl down "All applications"
2) If you want to remove ALL your keyboard shortcuts from LiveType, highlight LiveType and press the minus ( - ) key. 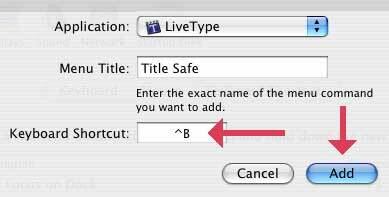 3) If you want to remove only ONE keyboard shortcut, twirl down LiveType, highlight the shortcut you want to remove and press the minus ( - ) key. This tip is from an upcoming issue of "Larry's FCP Newsletter." This mostly-monthly newsletter is free and you can sign up at: www.larryjordan.biz. Larry Jordan is an Apple-Certified Trainer for Final Cut Pro and DVD Studio Pro. He is also one of the first trainers in the country to be Certified to teach the Advanced Level of Final Cut. To learn more, visit: www.larryjordan.biz.